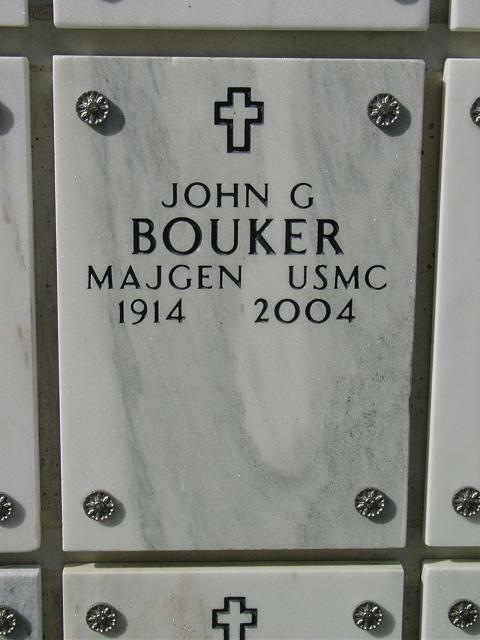 Major General John G. Bouker retired from active duty on August 31, 1968, after having served for 33 years. Prior to his retirement, he served from March 1967 until July 1968, as Deputy Commander, Fleet Marine Force, Pacific (Forward)/Deputy Commander, Marine Corps Bases, Pacific (Forward), earning a Gold Star in Lieu of a second Legion of Merit. John Griswold Bouker entered Dartmouth College, Hanover, New Hampshire, enlisting in the Marine Corps Reserve in June l935 while still in college, and completed Marine Platoon Leaders' Class at Quantico, Va. that August. Upon graduation from Dartmouth in 1936, he was awarded a B.A. degree, and was commissioned a Marine Reserve second lieutenant in August 6, 1936, to rank from July 1, 1936. During the next three years, he was employed by the Liberty Mutual Insurance Company of Boston, Massachusetts. In April 1937, he joined the 2d Infantry Battalion, Organized Marine Corps Reserve, in Boston. On September 30, 1939, he was ordered to active duty as a first lieutenant, and completed the First Reserve Officers' Class at Marine Corps Schools, Quantico, that November. Assigned next to the Marine Barracks, Parris Island, S.C., Lieutenant Bouker served as a battery commander with the 3rd and 4th Defense Battalions, FMF, until February 1941, when he embarked with his battery for Guantamamo Bay, Cuba. In October 1941, he returned to the United States serving in the Artillery Section (later the Gunnery Section) of the Division of Plans and Policies at Headquarters Marine Corps for 18 months. During this period, he was promoted to captain in February 1942, and to major in August l942. In June 1943, after instruction in the Coast Artillery School, Fort Monroe, Va., Major Bouker embarked for the Pacific area. He took part in three World War II campaigns, including the occupation and defense of Cape Torokina during the Treasury-Bougainville operation, the consolidation of the northern Solomons, and the assault and occupation of Okinawa. For meritorious service as Commander, Seacoast Artillery Group and Operations Officer, 3rd Defense Battalion, First Marine Amphibious Corps, FMF, on Bougainville, from November 1943 until 1 February 1944, he was awarded the Bronze Star Medal with Combat "V". He was promoted to lieutenant colonel in April 1944 while serving with the 3rd Defense Battalion on Bougainville. In April 1945, Lieutenant Colonel Bouker arrived at Okinawa Shima, and participated in combat against the enemy as III Amphibious Corps Artillery Target Information Center Officer. He returned to the United States in August 1945, and was integrated in the regular Marine Corps while stationed at the Marine Corps Recruit Depot, Parris Island, South Carolina. In October 1946, after completing the Advanced Naval Gunfire Course at Marine Corps Schools, Quantico, Virginia, he was assigned to Pearl Harbor as Naval Gunfire Officer, Headquarters, Fleet marine Force, Pacific until May 1948. Lieutenant Colonel Bouker was next stationed at Marine Corps Schools, Quantico, Virginia, for three years. During this time, he was 2d Battalion Executive Officer of the Platoon Leaders Class Training Regiment, was an instructor in the Basic School, completed ther Senior Course, and served as Director of the Officer Candidate Screening School. In August 1951, he was named Commanding Officer of the 2d Battalion, Third Marines, 3rd Marine Brigade (later 3d Marine Division), Fleet Marine Force. Shortly after arriving at Camp Pendleton for this assignment, he was promoted to colonel, in December 1951. 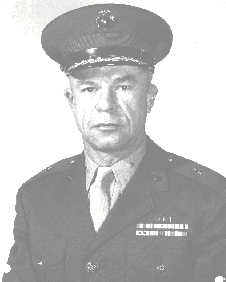 Remaining with the 3d Marine Division, Colonel Bouker served as Regimental Commander, Third Marines, and Assistant Division G-3, respectively, until June 1953. That same month, he began a three-year tour of duty as Professor of Naval Science and Commanding Officer of the NROTC unit at Cornell University, Ithaca, N.Y. In July 1956, he again embarked for the Far East, where he joined the 3rd Marine Division, and served as Regimental Commander of the Third Marines in Japan and on Okinawa. In, September 1957, Colonel Bouker returned to the United States and served for a year as Headquarters Battalion Commander, Marine Corps Base, Camp Lejeune, N.C., before entering the National War College, Washington, D. C., as a student. Upon graduation in June 1959, he was assigned to the Office of the Joint Chiefs of Staff, serving there until October 1961. Ordered to Headquarters Marine Corps, General Bouker was promoted to the rank of brigadier general on November 1, 1961, and that same month became Deputy Director of the Marine Corps Reserve. He served in this capacity until February 1962, when he assumed duties as Commanding General, Landing Force Training Unit, Pacific Fleet, Coronado, Calif., and remained there until April 1964 when he was assigned to the 2d Marine Division, FMF, as the Assistant Division Commander. During his tour with the 2d Division, General Bouker commanded the 4th Marine Expeditionary Brigade which participated in the April-June 1965 Dominican Republic Operation. For his service in the capacity, he was awarded his first Legion of Merit with Combat "V". On September 3, 1965, General Bouker became Commanding General, Force Troops, Fleet Marine Force, Atlantic, Camp Lejeune, N.C., and earned a Letter of Commendation for service in this capacity. He was promoted to major general on December 14, 1966. After his detachment, he reported to Fleet Marine Force Pacific, where he retired from active duty on August 31, 1968. A complete list of his medals and decorations includes: the Legion of Merit with Combat "V" and Gold Star in lieu of second award, the Bronze Star Medal with Combat "V", the organized Marine Corps Reserve Medal, the American Defense Service Medal with Base clasp, the American Campaign Medal, the Asiatic-Pacific Campaign Medal with three bronze stars, the World War II Victory Medal, the National Defense Service Medal with one bronze star, and the Armed Forces Expeditionary Medal.